Everyone has someone they aspire to be when they grow up, but when exactly is a person grown-up? I know I have much growth still waiting for me, even if the wrinkles on my face say otherwise! And maybe that�s where the fountain of youth can actually be found�in one�s desire to continue to be more. Kym: Welcome to the Cozy Corner Ann! Ann: Thank you for having me, Kym. 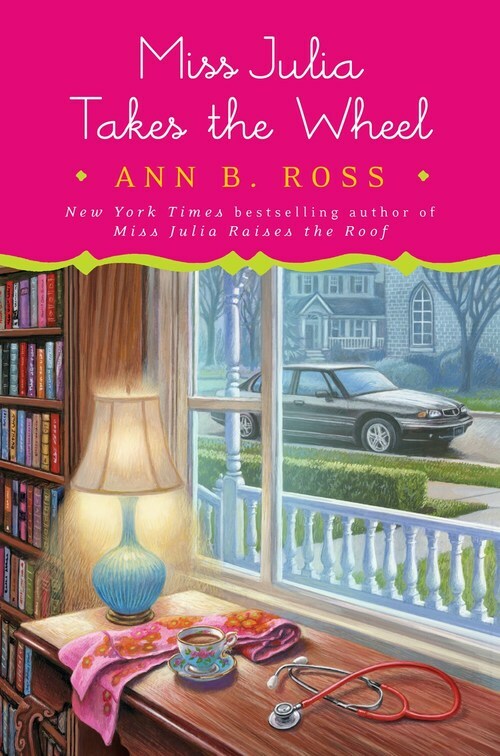 Kym: Your latest novel, MISS JULIA TAKES THE WHEEL releases April 2nd and is your twentieth Miss Julia novel. What do you think makes Miss Julia so popular with the readers? Ann: It�s still amazing to me that she is! 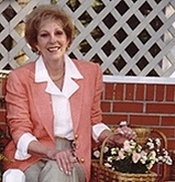 But I�ve had many emails from readers over the years that say in one way or another: �I am 72 years old, and I want to be just like Miss Julia when I grow up.� Many also write to say that Miss Julia says exactly what they�ve been thinking, so maybe she speaks for them. Kym: We all change as we grow older. Miss Julia however, is timelessly classy (and nosey), yet she has changed as well as her circumstances. What do you think is her biggest change from book one to book twenty? Ann: The biggest change undoubtedly came in the first book when she was able to defy the whispers, gossip, and laughter about Lloyd�s parentage and take that child into her heart as a person in his own right, in spite of the fact that he looked just like Wesley Lloyd Springer. She rose above caring what people thought, and that freed her to be her own woman. Kym: Miss Julia has a unique relationship with a young teenager, Lloyd, who happens to get a new car that he�s thoroughly embarrassed to drive (every teenager should feel this way; it�s a rite of passage!) How would you described their relationship to our readers who haven�t enjoyed Miss Julia�s interesting past as of yet? Ann: I would tell them to read the first book, MISS JULIA SPEAKS HER MIND, which explains who Lloyd is and why his sudden appearance in her well-ordered life caused so much distress. As for their present relationship, I think it is based on the fact that they were both in need of stability, love, and a meeting of the minds, and they found those needs met in each other in spite of the age differences. Kym: I loved your tie-in to the Sadie Hawkins Day Dance, (Do they still have them?) since I just happen to share an old family name with Daisy Mae, and wore a Daisy Mae costume as a teenager. (my kid wouldn�t be caught dead in it) Lloyd�s dilemma about dancing with a friend who was taller cracked me up. What memorable experiences do you have with a Sadie Hawkins dance? Ann: Not very memorable ones, I�m afraid. My grandchildren tell me they still have Sadie Hawkins Day Dances, but some schools call them Turnaround Dances or some such, but the girls still ask the boys. I�m not sure that students today know anything about Daisy Mae and the other residents of Dogpatch, to their detriment, I might add. Kym: LOL, I whole-heartedly agree! Miss Julia�s attitude about worrying is the essential make-up of a lot of women. ��if I don�t worry, who will? I just wish I could find something to worry about that I could do something about. I feel a great need to fix something. I just can�t find anything that�s fixable.� Is this the core character trait of Miss Julia that causes her to be in so much trouble all the time? Ann: Well, you know that in order for a novel to be a novel, it has to have conflict, so my biggest concern with each book has been to determine what that conflict will be. And since Miss Julia is the main character, it follows that she has to be involved in it, preferably to fix it�to bring order out of disorder. When Miss Julia�s doctor takes an extended vacation, however, she needs to get to the bottom of why he�s got a stranger taking his place for so long and asks the new doctor and his wife to dinner. How do you think today�s society would benefit by making such an invitation to new neighbors, and would you do it yourself? Ann: I try not to worry too much about benefiting today�s society�too many people are already doing that. I just try to find a few things to laugh about. But I am in a unique position as the wife of a doctor, so it�s not unusual for us to have doctors and their wives for dinner. As for inviting new neighbors, it�s often done in Abbotsville which is a fairly social little town anyway, and the ladies of the town are fully versed in the way things should be done. But they do it not to benefit society, but mostly because they love to entertain with their good china and silver. Young Lloyd takes an interest in sleuthing and has a pretty good knack for finding trouble. Will we see Lloyd get into even more trouble in Miss Julia�s next adventure? Ann: I am a little more than halfway through the next adventure, and so far Lloyd has not appeared. One of the pleasures of writing these books, though, is going back through the previous books and selecting minor characters to bring forward for starring roles. It�s like having an entire town to choose from, especially since readers seem to feel the same way. Kym: How true! Miss Julia is Lloyd�s confidant when he learns of a local �happy house.� What made you take on that topic for your latest mystery? Ann: I chose it because of the current opioid crisis, and because I have grandchildren in middle and high school. I try to stay up to date with what�s in the news, hoping that an �ah-ha� moment will occur. Kym: You are from a generation of women who embraced their empty nests and returned to college to obtain degrees as their children obtained theirs. How do you think that experience developed Miss Julia, and possibly her friend, LuAnne, who went back to work (at the funeral home!) after her divorce? Ann: My greatest ambition as a young woman was to get an education, but because of family difficulties, an early marriage, and small children for several years, it wasn�t until I was middle-aged that I was able to go to college. But once I got in, my family thought I�d never get out since I stayed to earn three degrees. I had also always thought that I would write but felt that I needed to know something before I could write something. So having an education in literature gave me the confidence to at least attempt to write. Not, I hasten to add, that I thought I could write at the level of the literature I�d studied, but at least I knew what great literature was. And some of the confidence came from learning that popular literature also has a place�not a long-lasting place, perhaps, but at least a welcome place. Kym: I absolutely LOVE your drive, and that you admit to eavesdropping on conversations in restaurants to get inspiration. Can you tell us about your most recent discovery that you�ve added to the page? Ann: I�m not sure exactly what page I�ve added a recent discovery to... If it�s something I�ve mentioned on Facebook, I may be able to say something before I send this to you, but then again, it may not have jelled by then. Stay tuned! Kym: All of your Miss Julia novels are published in German, Japanese and Croatian. Have you had to overcome any cultural issues with readers because of your widespread publication? Ann: I don�t think the books are still being published in the languages you�ve mentioned, but some of them have recently been published in Italian. And it�s astonishing to me that something as deeply Southern as my books would be read in such different cultures. Last year a woman in Italy contacted me to say that her adult class is reading my books in English in order to improve their spoken English. I had to laugh for my books are certainly not written in Standard English, and I could just picture a group of fashionable Italian men and women speaking a down-home, deep-South dialect. Kym: OMG, that would be hilarious to hear! Many readers of a series have a favorite book. Is there any book in the Miss Julia series that stands out to you as a writer, or are you in the moment with each book you write? Ann: I am mostly in the moment of whatever book I�m working on. In fact, I often have to stop and think what the last one was about. But I must say that the first book will always stand out for me since it started everything. When I was shopping around for an agent, all I hoped for was to have that one little book published with no thought of anything else. I was sure that in it, Miss Julia had said all she had to say, or at least, I had. But I can still recall the amazement and downright fear I had when I learned that not only did a publisher want that book, but three more, besides. And that wanting hasn�t stopped yet. Kym: I�m sure I�m one of many who wants the series to continue to be a success! Where can our readers find you? Kym: Thank you for joining us on the Cozy Corner! Ann: And thank you again for having me. Your questions have been on the mark, very thought-provoking in fact, and I�ve enjoyed answering them. Until next time, get cozy and read on! All the power to you , I wish I could write, I always tried but was never good at it !!! I discovered Miss Julia at BlueWillow Bookstore in Houston after a district library meeting. It was my first time in that delightful store and each time I returned, I bought another Miss Julia. Thank you for all the wonderful time I have spent with your books. This the first one that I can not share with my sister and that makes me a little sad but I suspect that I will feel like I am sharing it with her as I read.